My youngest daughter lives near the Ridgefield National Wildlife Refuge in southern Washington State. My wife and I were visiting her this past June when I decided to see if I could get some good bird photos. The refuge is primarily inhabited by large numbers of migratory waterfowl in the spring and the fall and has a relatively small number of summer avian residents. However, last time I visited her in summer I got a pretty good shot of a fledgling great horned owl that is in my "Bird Gallery". So I decided to give it a shot. I got out my 100-400mm zoom telephoto lens, popped it onto my Canon 5D Mark II camera body and left my other lenses including my macro at my daughter's house. I trekked down to the sanctuary and was walking along a dirt road on one of the dikes that impounds water for the waterfowl. However, at first I did not see a single bird, but I did see was lots of Tule Bluets, (a type of damselfly) flitting around near the ground with several pairs of them mating. There I stood, no macro, no standard length prime with close focus, and I had neither an extension tube nor a close-up lens to convert my telephoto zoom lens into a macro. 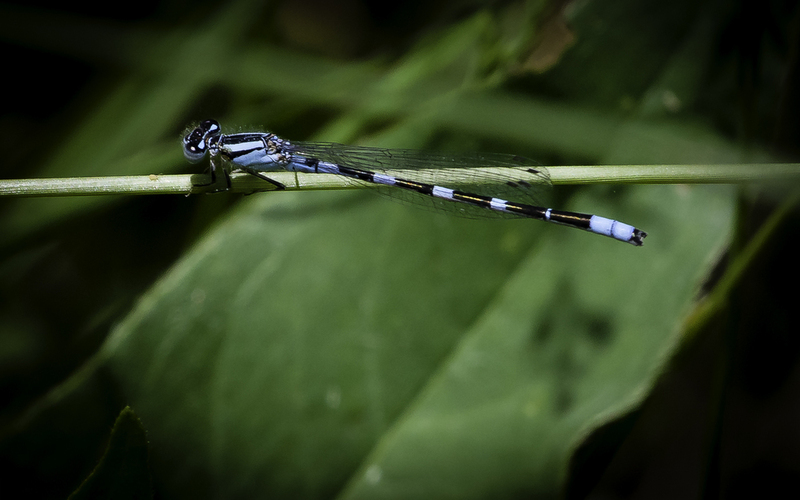 I desperately wanted to get some macro shots of these damselflies but I just had my 100-400mm zoom telephoto lens. Zoomed to 400MM focal length.